FBN’s Ashley Webster breaks down the latest weekly jobless claims data. The number of Americans seeking first-time unemployment benefits rose slightly last week, but remained consistent with an economy steadily adding jobs. Initial jobless claims, a proxy for layoffs across the U.S. economy, increased by 1,000 to a seasonally adjusted 295,000 in the week ended April 18, the Labor Department said Thursday. Economists surveyed by The Wall Street Journal expected 290,000 claims. Claims for the prior week were not revised. The claims reading had been volatile in recent months, but the figures are settling back near the lowest levels of the economic expansion. The four-week moving average of claims, which smooths weekly volatility, rose by 1,750 to 284,500. That is just above the post-recession low of 282,500 touched earlier this month. The low level of layoffs signals that the labor market is making gains despite a slowdown in hiring last month. The economy added 126,000 jobs in March, far below the average 269,000 jobs created in the prior 12 months, the Labor Department reported in early April. The unemployment rate held steady at 5.5%, slightly above the 5%-to-5.2% range that the Federal Reserve considers the economy&apos;s long-run average. But while job growth has been steady and layoffs are historically low, there are other signs of weakness in the labor market. Wage gains have struggled to accelerate beyond a 2% annual pace and the share of Americans working or seeking work is near the lowest level since the 1970s. Federal Reserve officials meeting next week must judge those mixed signals alongside an economic slowdown in China and other parts of the globe. The central bankers will discuss the timing of an interest-rate increase. Rates have been pinned near zero since the recession. 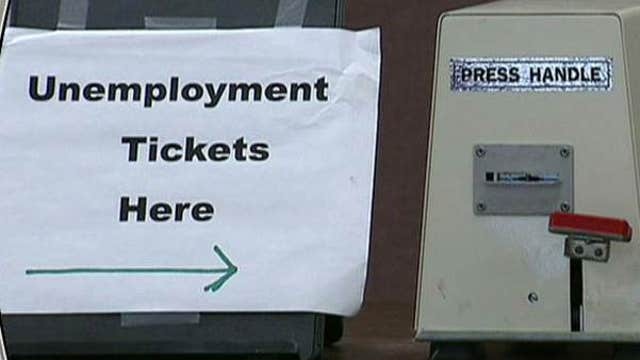 Thursday&apos;s report showed the number of continuing claims for unemployment benefits rose by 50,000 to 2.33 million for the week ended April 11. The four-week moving average of continuing claims is the lowest since December 2000. Continuing claims are reported with a one-week lag. The Labor Department said there were no special factors impacting the latest claims data, but figures for Puerto Rico were estimated due to a holiday in that territory. Write to Eric Morath at eric.morath@wsj.com and Josh Mitchell at joshua.mitchell@wsj.com.